Search through all of the homes for sale in Gillette and surrounding areas. If you already have a property in mind, please don't hesitate to contact us with any questions or to set up an appointment to go take a look. If you are interested in selling your home, take a few moments to review our marketing plan for your home and then please contact us about receiving a free market evaluation of your homes value. If you are from out of town or just beginning the process of feel free to estimate your payments with our mortgage calculators. 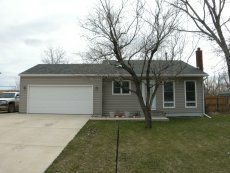 2533 Rose Creek- This is a great home in a prime location close to schools! Featuring 3 bedrooms and 1.75 bathrooms this home has been redone inside and out. With a beautifully remodeled kitchen and bathrooms, newer flooring, newer siding, and new skylights, this home is move-in ready! Other features include a private master bedroom with a huge closet and very nice master bath, and extra parking for your toys! Priced at $208,900. Click the picture for the virtual tour or watch the youtube video! If this is not the perfect home for you, simply contact us and we will help you find exactly what you're looking for. If you have spent countless hours searching the internet and have not found the right home, we can help! Our office has a number of "pocket listings" (people who are willing to sell their homes but don't want them advertised as for sale) that we can show very easily!